Roof damage on your home can happen at any time of year. However, there are some problems that are more likely to occur during certain seasons rather than happening year round. 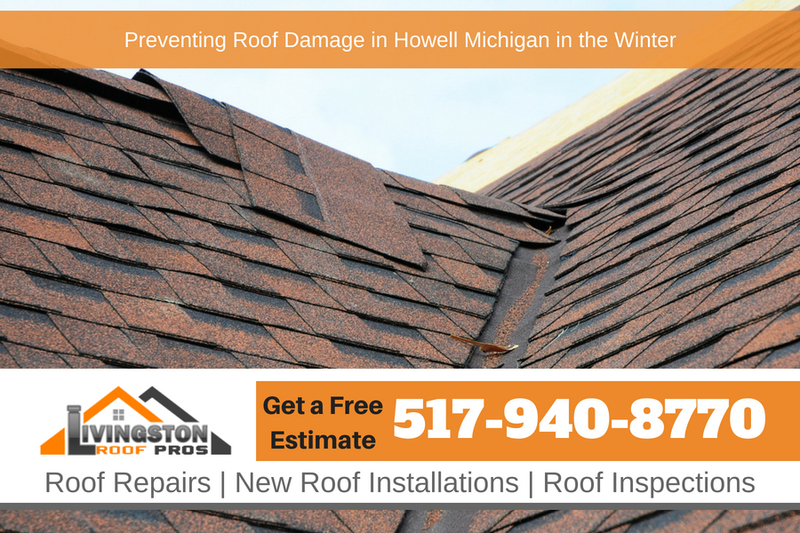 Winter in Howell Michigan can bring snow and ice that threaten your home’s roof while the summer months bring hail and thunderstorms which can have damaging winds that can damage your roof. Knowing what you should look for to prevent roof damage in Howell Michigan is important and can help to protect your roof from damages. You should clean your gutters before snowfall to prevent ice buildup. If the gutters get clogged, melted snow can’t run off the house and will build up on the roof, eventually forming a chunk of ice. As you’d expect, the slab of ice would weigh down the roof, causing leaks and shingle damage on your roof. If you notice your gutters are clogged with ice, you need to call a professional roofing contractor in Howell Michigan to clear the jam. Attempting to work on your roof during the winter is very dangerous because you can easily slip and fall on the ice and be seriously injured or killed. If the temperatures don’t drop, snow will continue to compact on your roof, adding more and more weight. Depending on how much weight your roof can handle, it’s possible that it could collapse. In addition, compacted snow can clog the gutters, leading to ice buildup on the roof. One of the most common factors leading to a roof collapse is lack of maintenance. Getting a roof inspection done regularly on your roof is crucial to ensure it can withstand the problems that winter brings. While ice covered trees make for a picturesque view here in Howell Michigan, they aren’t so great when they’re hanging over your house. When the ice starts to melt, water from overhanging trees will fall directly on your roof. Not only will excess water fall on your roof, but the branches themselves can fall if there is enough weight on them. Falling branches can break roofing shingles as well causing roof leaks on your home. One of the keys to preventing roof damage during the winter is getting it inspected before the winter. A contractor will identify damaged shingles, gutters, and holes. Any damage needs to be repaired before snowfall hits. Once the roof is covered with snow, existing damage will only get worse and do more harm to your roof. Your roof needs to be well-insulated to handle extreme shifts in temperature. Since you’ll likely have the heat on during the winter, poor insulation can cause the snow on top of your roof to melt. Subsequently, the melted snow will refreeze to form ice and potentially lead to leaks and ice dams. With that said, good insulation will mitigate temperature fluctuations. Remember, when it comes to working on your roof during the winters, hiring a professional contractor in Howell Michigan to do the work is a must. Homeowners should never step on an icy or snow-covered roof during the winter. The chance of falling and breaking a bone is significant. For a free estimate to have your roof inspected or repaired, call Livingston Roof Pros at 517-940-8770. Don’t wait till it’s too late.